'Arab Idol' Finalist Delivers Sweet Music, Palestinian Pride : Parallels In the Arab world's version of American Idol, a young singer from the isolated Gaza Strip is hitting the high notes of Palestinian hope. Supporters say a victory by Mohammad Assaf, a finalist in the competition, would be a victory for art, which has been long neglected in Gaza. Palestinians have rallied around Mohammad Assaf's success. Supporters say his victory would be a win for art, which has been long neglected in Gaza. In Palestinian territory, Mohammad Assaf's face is easy to find. Big posters of the dark-haired 23-year-old dreamboat smile at you along boulevards in Ramallah. And in Gaza, a giant banner of Assaf billows outside his family home. Assaf's dad, Jabar Assaf, is bursting with pride. 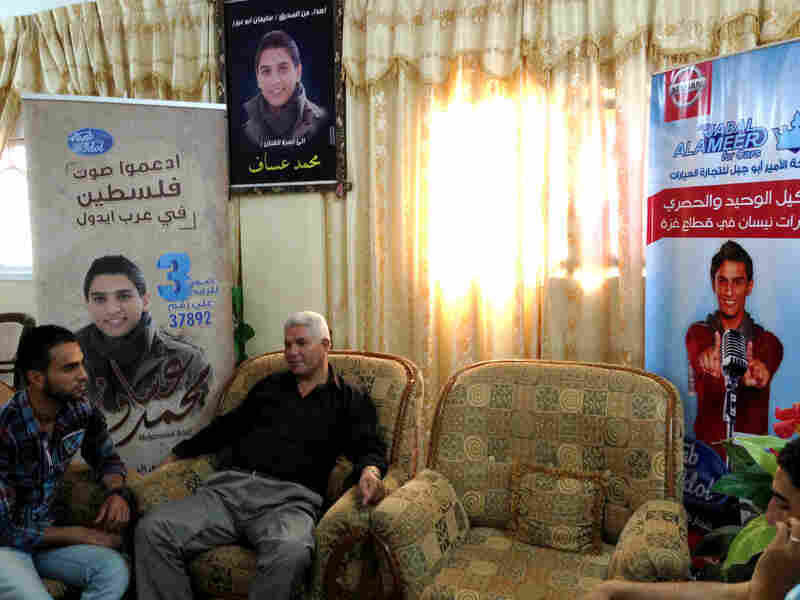 Posters of Arab Idol competitor Mohammad Assaf decorate his family's home. Both Mohammad's father, Jabar Assaf (right), and his best friend, Mohammad Abu Jabar, say a victory for the young singer from the Gaza Strip would be a win for all Palestinians. "I'm very, very, very proud of my son. Besides singing so well, he is very polite, and he is studying at the university," Jabar Assaf says. "He's no street kid. I'm very proud." So are many other Palestinians — including 16-year-old Abeer Ali. "I will be so happy if he wins, because he's from my country," Ali says. "We love him so much." Assaf is a finalist in the Arab world's version of American Idol, the TV search for new pop superstars. Broadcasting from the Lebanese capital, Beirut, Arab Idol is just wrapping up its second season. And the young singer from the isolated Gaza Strip is hitting high notes of Palestinian hope. When Assaf appeared in an early round of the TV show, young men at the Delice coffee shop in Gaza City cheered. That night, he picked an Arab pop classic to sing: "Ya Rait," or "I Wish." Both the TV audience and the crowd in the coffee shop roared with approval. Assaf almost didn't make it onto Arab Idol. He had trouble getting out of Gaza. He was late to the audition in a Cairo hotel, and security wouldn't let him in. 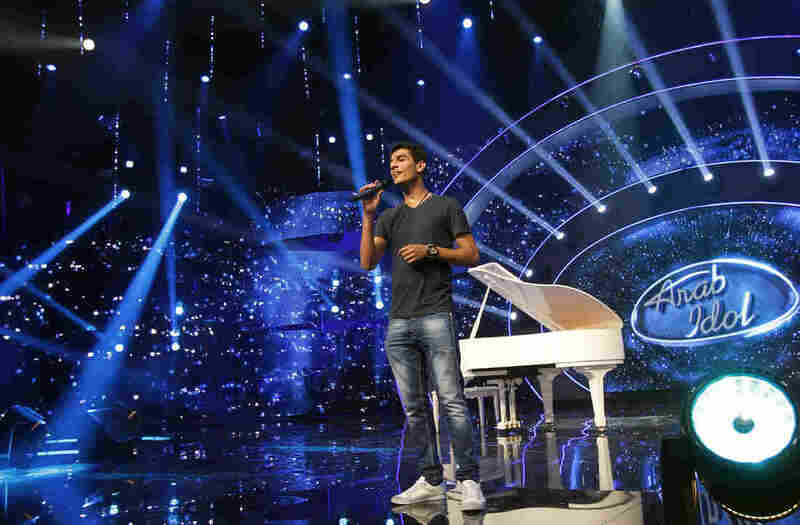 Palestinian performer Mohammad Assaf is a finalist on Arab Idol, which is filmed in the Lebanese city of Jounieh north of the capital Beirut. But he jumped the hotel fence, and warmed up with the other contestants anyway. After hearing his story, and his voice, another Arab Idol hopeful gave up his spot for Assaf. Ramadan Adeeb Abu Nahel says he doesn't regret it. "When I heard him practicing, I gave him my audition number," Nahel says. "He started to smile, and after he finished the song, he hugged me and said, 'Thank you very much, I will never forget your favor.'" One of Assaf's close friends says if his buddy wins, it will be a victory for art, which has been long neglected in Gaza. Assaf's father says a win by his son would mean much more than that. "It would be a great message to the whole world. Look, Gaza is not just full of terrorism and violence. Palestinians are like other people, interested in sports, art, music, books," he says. "His victory will be a message from the Gaza Strip and from Palestine."